Brazil, Russia, India, China and South Africa have declared the launch of the group’s developmental bank and currency fund in a joint statement made at the BRICS summit in Fortaleza, Brazil. The bank’s headquarters will be in Shanghai, while its first president will be from India and the first chair of the board of governors from Russia. The leaders of the BRICS nations have launched their much-touted $100 billion developmental bank and a currency fund, in what is being seen as the most important economic measure taken by the grouping. 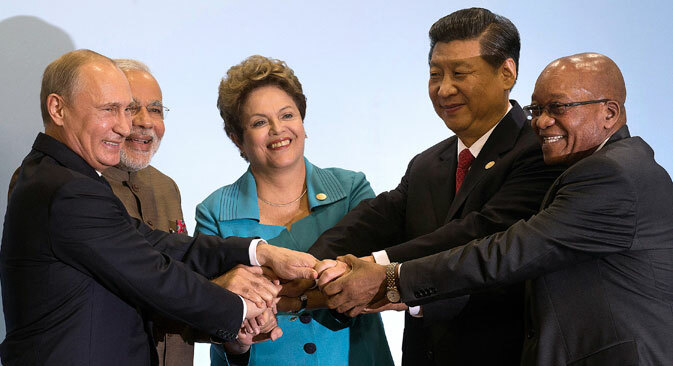 “We are pleased to announce the signing of the agreement establishing the New Development Bank (NDB), with the purpose of mobilizing resources for infrastructure and sustainable development projects in BRICS and other emerging and developing economies,” the leaders of Brazil, Russia, India, China and South Africa said in a statement made on July 15 at the BRICS summit in the Brazilian city of Fortaleza. “Based on sound banking principles, the NDB will strengthen the cooperation among our countries and will supplement the efforts of multilateral and regional financial institutions for global development, thus contributing to our collective commitments for achieving the goal of strong, sustainable and balanced growth,” they added in the statement. The developmental bank will have an initial authorized capital of $100 billion, with initial subscribed capital of $50 billion, equally shared among the five members. The headquarters of the bank will be located in Shanghai. According to the statement, the first chair of the bank’s board of governors will be from Russia, the first chair of the board of directors from Brazil and the first president of the bank from India. The countries added that a regional center of the NDB will be established in South Africa concurrently with the headquarters. The launch of the developmental bank is being seen as a major step in bringing forth closer economic cooperation between the members. “I am confident that closer cooperation between the BRICS states in the area of economy and finance will facilitate the implementation of really large-scale joint programs in the interests of the sustainable development of our countries,” Russian President Vladimir Putin said at the end of the conference. The BRICS members also signed a treaty for the establishment of the BRICS Contingent Reserve Arrangement, which will initially be set at $100 billion. “This arrangement will have a positive precautionary effect, help countries forestall short-term liquidity pressures, promote further BRICS cooperation, strengthen the global financial safety net and complement existing international arrangements,” said the joint statement. In the joint statement, the leaders said they “remain disappointed and seriously concerned” with the current non-implementation of the 2010 International Monetary Fund reforms. They argued that the lack of reforms has negative impacts on the IMF’s legitimacy, credibility and effectiveness. The leaders said the IMF must remain a quota-based institution.